Ferida Nisic points out a spot where bodies of mudered civilians from the Bosnian War in the 1990’s were dug up four years ago. Nisic was present for the excavation in 2010, and she had not returned until this day, December 5, 2014. Photo by Emerald O’Brien. The fog on the mountainside is thick as Ferida Nisic returns to a lumpy, green patch of land that she hasn’t seen in four years. For years,14 bodies lay hidden below, unbeknownst to the villagers and shepherds that lived there. There were always rumors that bodies of missing locals were buried on this Bosnian mountain side after the war. Four years ago, those rumors turned out to be true. On November 15th, 2010 this mass grave was discovered, holding Bosnian Muslims killed by Serbians between 1992 and 1993. According to Nisic, who is the secretary of the local organization for victims and their families and who lost 18 family members herself, the rumors suggest that these victims were local civilians. They were ambushed while trying to reach the nearest Bosniak controlled area after Bosnian Serb Army forces took over their small town of Hadzici. But, these are only a few of the missing from the area. Of the 250 Nisic says went missing from Hadzici, 90 have yet to be found. 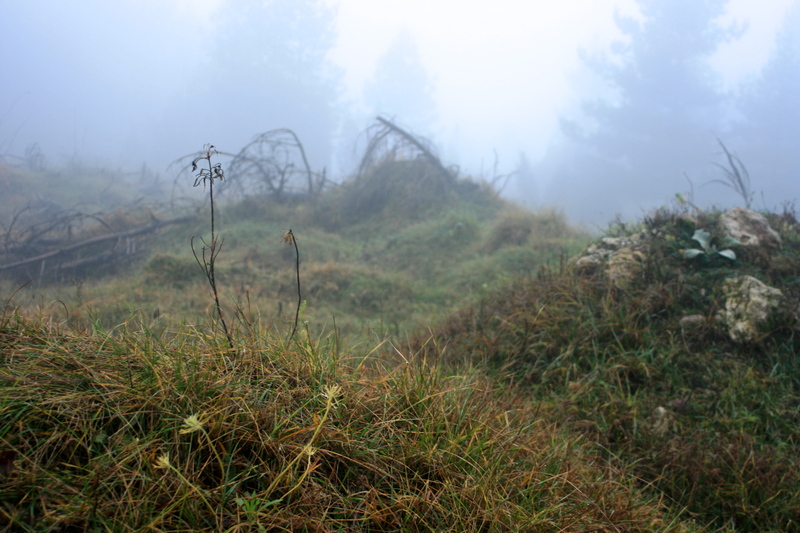 On the Bosnian mountainside where this mass grave was found, the ground is now uneven, a result of the excavation process in 2010. Nisic says that her organization expects that 20 more bodies are buried in the area, in addition to the 14 already found. Photo by Emerald O’Brien. Hadzici is not the only place in Bosnia and Herzegovina with this problem. Across Bosnia, around 9,500 people are still missing, accounting for approximately 30 percent of the 31,500 people missing from the war in the 1990’s. 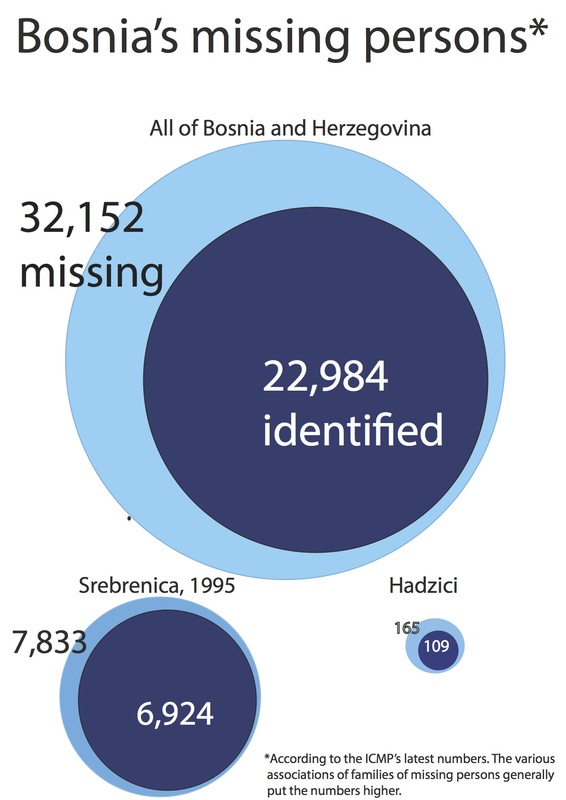 However, the Bosnian-born international organization which was largely responsible for finding and identifying the 70 percent of the missing now found, the International Commission for Missing Persons (ICMP), is soon leaving home. Control of the search for the last of the missing persons will be handed over to a national institute, but in a country with large political rifts and pressing economic issues, continuing the search could be difficult. The search for missing persons is both a personal issue for the families of the missing, but it also goes beyond to the political and legal spectrum. “The most important reason to find the missing persons is to diminish the suffering of the relatives. Living with uncertainty of what happened and a faint hope that their relatives are still alive causes deep psychological traumas,” says Adrijana Hanusic, Legal Advisor of Track Impunity Always (TRIAL), an NGO working for the interests of victims of unpunished crimes. She mentions insomnia, depression and post-traumatic stress disorder as some of the possible consequences of continuously not having concrete information about the fate and whereabouts of their relatives. Since it is customary during the Muslim holy month of Ramadan to pay respect at the grave of dead loved ones, for Muslims, which most of the relatives are, not having an actual grave of a buried relative can also be difficult, she says. Another reason to find the missing persons is to have concrete evidence in the prosecution of the perpetrators. For example, the discovery of 300 previously unknown bodies in 2013 near Prijedor in northern Bosnia was used in the indictment against one of the highest ranked accused war criminals, Ratko Mladic, former Bosnian Serb military leader. “The exhumed bodies of missing persons are not the only evidence of war crimes we have, but they help prove that the killings were systematic, massive and organised. That it was, in fact, a genocide,” says Hanusic. Ratko Mladic opposed the evidence from the recently discovered mass grave. Read more here. 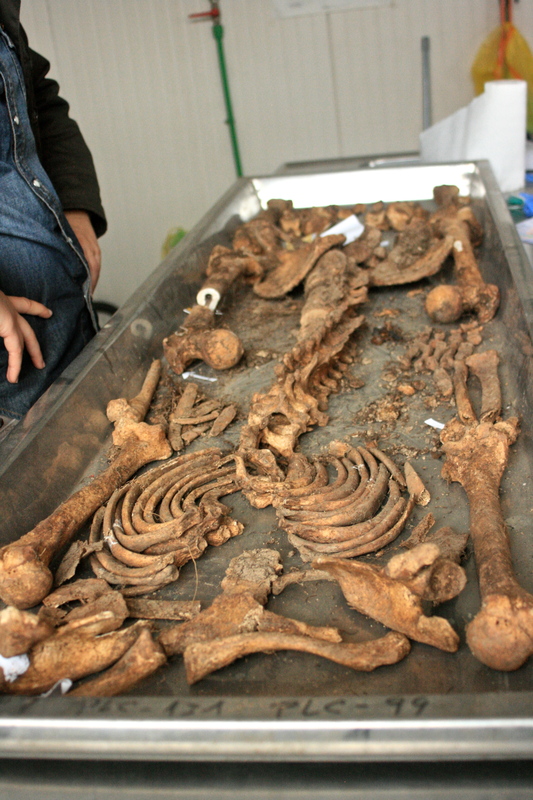 The remains of a victim from the genocide at Srebrenica are assembled at a lab in Tuzla on December 3, 2014. At Srebrenica, over 8,000 people were killed within seven days in 1995. Photo by Emerald O’Brien. Some 130 kilometers north of the Hadzici mass grave, in the industrial city of Tuzla, Dragana Vucetic, Senior Forensic Anthropologist of the ICMP is assembling a skeleton. Arms, legs, spine and ribs are all there. A small section has been cut out of the thigh bone and sent for DNA testing. Most major bones have been accounted for, only the skull is missing. “It may have been taken as a trophy”, she says. When the Army of Republika Srpska reached Srebrenica in July of 1995, intent on killing the entire adult, non-serb, male population of the town, Tuzla was the nearest Bosniak-controlled city and therefore the safehaven the fleeing men of Srebrenica tried to reach. Many of them were caught, executed and buried in mass graves in the mountainous terrain between Srebrenica and Tuzla. In a lab set up in Tuzla, Vucetic and her colleagues have worked to identify the 8,373 people that went missing after the genocide in Srebrenica. As of July 2014, the bodies of 6,492 had been identified. Vucetic’s job is to piece together the often partial skeletons and to find the most appropriate bones for DNA-sampling. The skeleton she is currently working on was found in a single grave and is thus a relatively straightforward case. The biggest challenges in her job stem from the so-called secondary graves. Three months after the genocide, the perpetrators realized they might face prosecution, so in an effort to hide the evidence further, they dug up the partly decomposed bodies, and reburied them in new gravesites. This created a morbid jigsaw puzzle with thousands of bones and body parts scattered around multiple graves. In one case, remains of a single person were found at four different mass graves and in 15 different locations. “Whenever I am not sure if the bones belong to the same person, I take another DNA-sample. It’s better to be on the safe side, than to bury two people in the same grave,” Vucetic says. 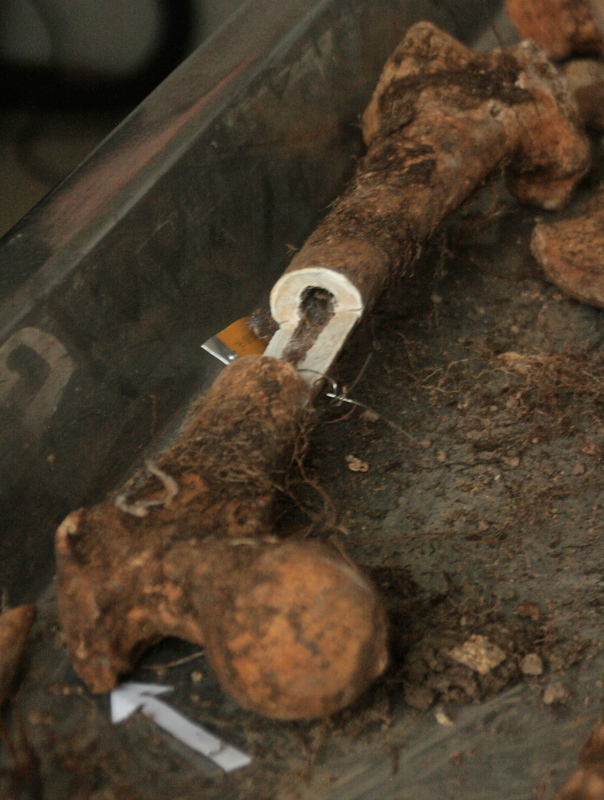 In order to identify the remains of missing persons, forensic experts must remove a piece of a bone and send it to a secondary lab for cleaning and DNA extraction. This thigh bone, seen at the Tuzla lab on December 3, 2014, was the chosen bone for sampling of the skeleton it belongs to. Photo by Emerald O’Brien. Leaders of the ICMP are scheduled to sign a treaty later this month recognizing the ICMP as a permanent international organization amongst other things, including approving the relocation of headquarters from Sarajevo to The Hague, Netherlands, in Spring 2015. Sites created by the ICMP, like Vucetic’s lab, will remain in place if the organization moves as planned. But control of the search will be almost completely in the hands of the Missing Persons Institute (MPI), the state controlled institution co-founded by the ICMP in 2005. Kathryne Bomberger, director of the ICMP, says that the MPI has been operating as an independent organization since its beginning, but that the move will signify the ICMP fully stepping out of the picture. It is unclear, though, whether or not ‘letting go’ will result in the success that all parties seem to want. The current political system of Bosnia was created as a part of the Dayton Accords – the agreement that ended the war but maintained the ethnic divisions that created violence in the first place. Heavy corruption and a poor economy with high unemployment rates are among the major issues resulting from this post-war set up. These are the same issues which fueled large protests throughout the country in early 2014, and they are a significant barrier in getting enough cooperation and enough funding to finish the job that the ICMP started. One of the mandates of the ICMP and the MPI is that the search is conducted without regard to ethnic background of the missing. 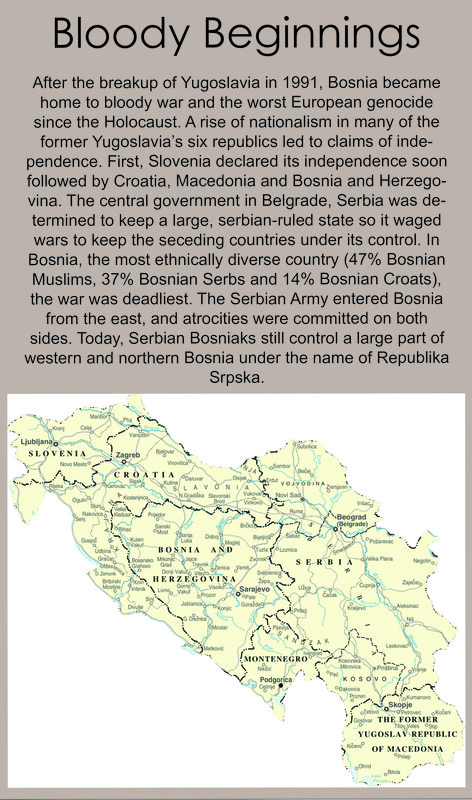 The violence during the war stemmed from the fact that Bosnia was the most ethnically diverse section of Yugoslavia, with large populations of Muslim Bosniaks, Catholic Croats and Orthodox Serbs. Without a strong overarching body to handle the issue, there is potential that the search could break down into ethnic groups only searching for their own – which could slow the process down and potentially cause more ethnic tension. Though the ICMP helped to create the MPI, Bomberger says there are still changes to be made within the institution, starting with the fact that the MPI has three board members to reflect the three-fold political system, which is often stalled by disagreement. “The amendments we’ve proposed are that they get rid of some of the management structures and that they get rid of the three members of the board of directors and that they have one,” Bomberger says. The chairman of the MPI, Amor Masovic, also expresses concern about their ability to operate under the circumstances, both within and outside of the Institute. “I dare to say that I am not satisfied with the cooperation in the government at any level; at state level or at entity level,” Masovic says. 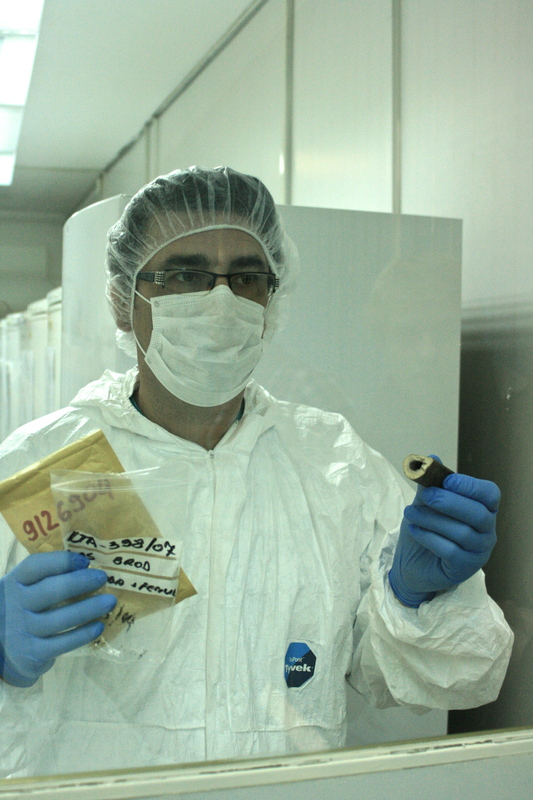 A worker at the ICMP’s DNA lab in Tuzla show a bone sample received from another lab. The bone will be cleaned and DNA will be extracted, and the information will then be added to the ICMP’s database which holds DNA information for all received bone samples, plus blood samples from 91,000 survivors who are missing relatives. Photo by Emerald O’Brien. Across town, in another lab in Tuzla at the ICMP’s Identification Coordination Division office (ICD), a man in a white, full-body suit is extracting DNA from a two-inch bone sample, sent from a lab like Vucetic’s. When he is done, he will note down his results and include them in the ICMP’s extensive DNA database. In another part of the office, a similarly dressed woman is extracting DNA from a blood sample. Approximately 91,000 blood samples collected from relatives of Bosnia’s 31,500 missing persons are stored here. DNA from these blood samples have also been included in the database. A small unit of technicians are in charge of the ICMP’s DNA database. Using specially developed software, they match relatives searching for loved ones with the remains of exhumed bodies. One parent, sibling or child is enough to make a match but when these are dead or missing, multiple cousins, uncles, aunts or other relatives are needed. The big screen in between their desks displays an example of their software and shows that Bosnia is not the only country where the ICMP is searching for matches. One folder in the software is titled Kosovo, another is called El Salvador and others again say Iraq and Libya. Since its foundation and relative success in Bosnia, the ICMP has been commissioned to work in some 40 other countries. Bosnia’s 70 percent success rate in identification is unmatched anywhere else in the world. Click here to view which countries the ICMP has been active in. The ICMP’s departure from Bosnia could mean a deadlock not only between the different ethnic groups but also between the families of the missing and the government institutions trying to find their loved ones. “Even though we have tried for 15 years, local authorities in Bosnia and international organisations, including the ICMP, haven’t succeeded in creating the right contacts with the associations,” says Amor Masovic. Approximately 100,000 people were killed in Bosnia between 1992 and 1996. 32,000 went missing and the search for some of them is ongoing. Infographic by Ole Ellekrog. That sentiment, at least, is shared by Ferida Nisic. She recounts the story of how her organisation of relatives of missing persons found the Hadzici mass grave and how she feels the MPI took credit for their work. She also says the MPI was reluctant to dig further at the site after failure to find bodies early on, that they have not come back for more excavations despite her organisation’s adamance that up to 20 more people are still buried in the area. Even when they did show up for the dig in 2010, she says, they had to rent an excavator which they only had for a few days. “What kind of an institution is this that searches for missing persons and doesn’t even have their own excavator?” she asks. One issue that has caused particular friction between the organizations of family members and the ICMP and particularly the MPI is the determination of how many people are actually missing. While Nisic claims 250 were missing from Hadzici, 90 of which have not been found yet, the official ICMP statistic says 168 went missing from the town and that 59 have yet to be found. On a larger scale, Mothers of Srebrenica, an organisation representing more than 6000 women related to the men killed in the genocide at Srebrenica, claim that 10,701 persons were killed in the western Bosnian town. Official statistics puts the number at 8,372. “The reason why there is such a difference between the data of international organizations and our evidence is because in some cases entire families were killed so there was nobody left to report the missing of those families,” Munira Subasic, head of Mothers of Srebrenica, says. Though Bomberger says the MPI is ready to take over fully, there are still significant burdens weighing on them. As Adrijana Hanusic from TRIAL sees it, the ICMP’s departure won’t mean a shutdown of the system, but a noticeable change. “The ICMP leaving Bosnia could make the process of finding missing persons more difficult. There are problems with the structure and the functioning of the MPI, with continuously vacant seats of its boards, alleged political affiliations of some of its members and problems with transparent dealing with the organisations of relatives. The process will continue, but it will slow down,” she says. The story is not over; 9,000 missing Bosnians are waiting for justice and it has yet to be seen how well the MPI will carry on the mission of the ICMP. However, the legacy of the last 20 years in Bosnia will now be boosted onto the global stage. Bosnia has set the foundation for the ICMP to replicate its results in countries around the world. A memorial to members of a small community just outside of Hadzici, Bosnia, who were killed in the war holds the names of 70 people. Of those 70, 18 hold the name Music, the family name of Ferida Nisic, including her father, Alija, and her brother, Mujo. Almost all of the people on this memorial, Nisic explains on December 5, 2014, were killed between 1992 and 1993. Photo by Emerald O’Brien. Back down the winding mountainside in Hadzici, out of the fog and past all of the houses holding stories of horror for the villagers who lived there, a two paneled white monument bears the names of 70 people from the village, all killed in the war. 18 of those names belong to Nisic, under her family name Music. Many of them are still missing, including her father, Alijah, and her brother, Mujo. 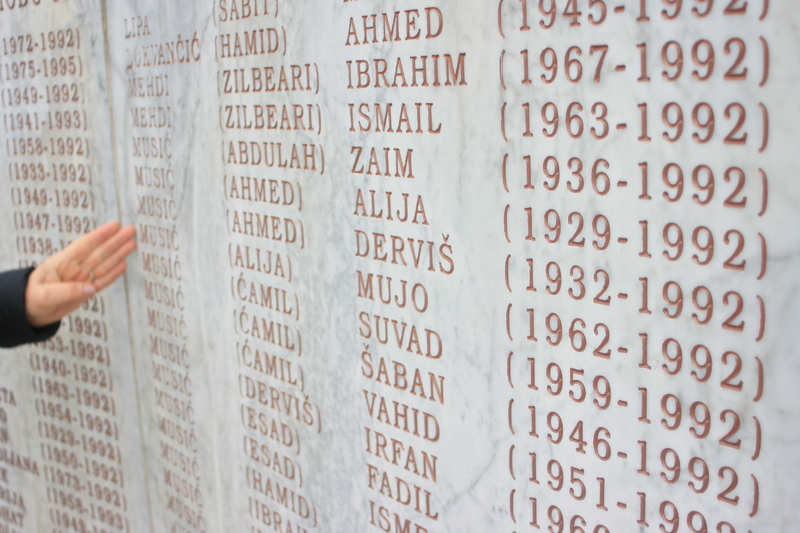 As Nisic remembers the stories of these 70 names, the noon call to prayer from the mosque next door sounds out. 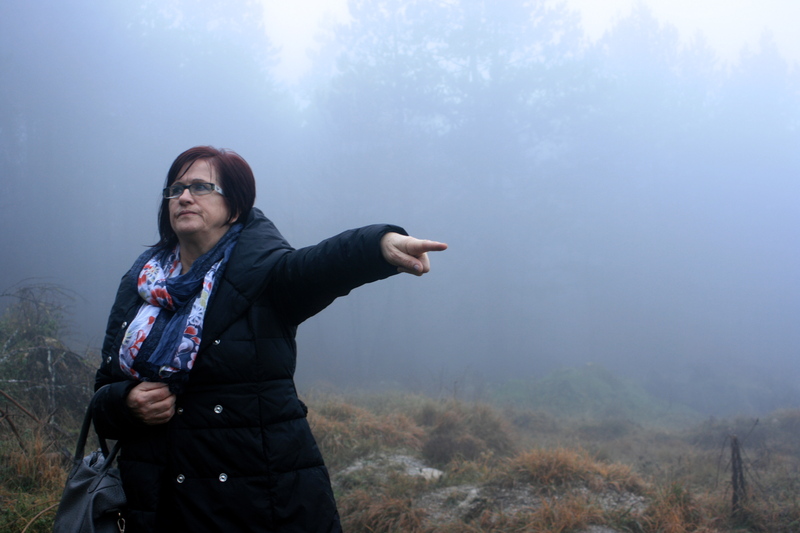 Though she has not had much success in finding the family she lost in the war, Nisic continues to search for her loved ones and the loved ones of those she represents in Hadzici. “Those who are looking will never be in peace until we find all of them,” Nisic says.